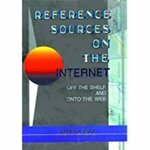 Book description: Reference Sources on the Internet: Off the Shelf and Onto the Web gives you a core list of online resources that will save those who visit your library considerable time. Its menu of current reference sites will help you wade through the mire of irrelevant, unreliable material and zero in on the cyberinfo that will more economically and accurately satisfy your users’needs. Diaz, Karen R. and Mai, Brent A., "Reference Sources on the Internet: Off the Shelf and Onto the Web" (1997). DiMenna-Nyselius Library Book Gallery. 9.